I marvel at the fact that I have so many routes close to home to explore and re-explore in Vermont and New Hampshire. I just never tire of shunpiking, especially on a day as today was! Alright, get your Vermont maps out (Vermont is very generous making their official state maps available unlike Massachusetts). I got home from church this morning and said, “Ray, you have wanted to visit the remote spot Daniel Webster gave a speech in 1840 – go for it.” An hour later BLUE BELLE (it was her turn) backed out of her bay. The map was highlighted with the route that included roads I had not been on in several years, or not before. Oh, too much fun !!! A great day out you may wish to follow. 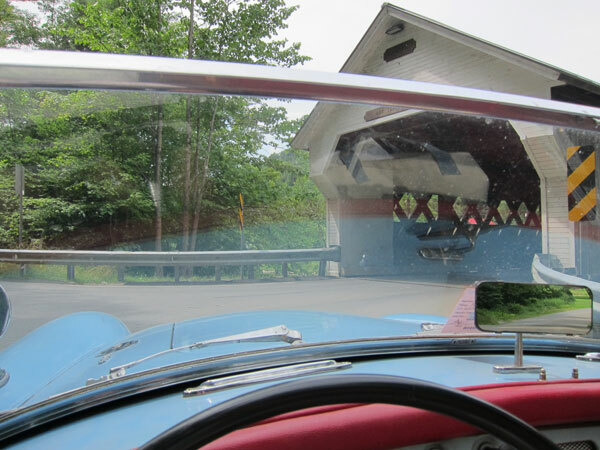 I shot down US Route 5 in Vermont and cut over through Dummerston Center to Route 30, turning north. writing. Next I came upon the Newfane flea market which I had not been to in maybe 9 years (that long since this stretch of road), and I stopped. It has dwindled in size, but I got two Archer Mayor mysteries that I have not read – a successful stop. 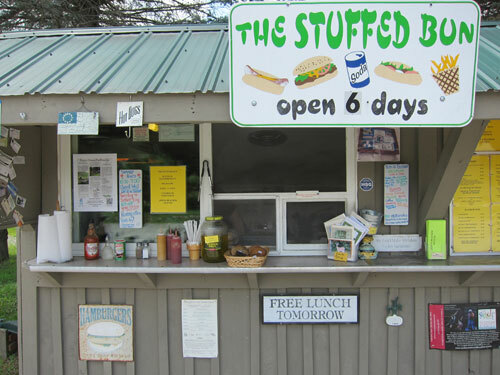 Passing through Townsend (still on Route 30) I was getting hungry and wanted a quaint roadside stop, and I found The Stuffed Bun. Wonderful food. Make sure you go TOMORROW!! 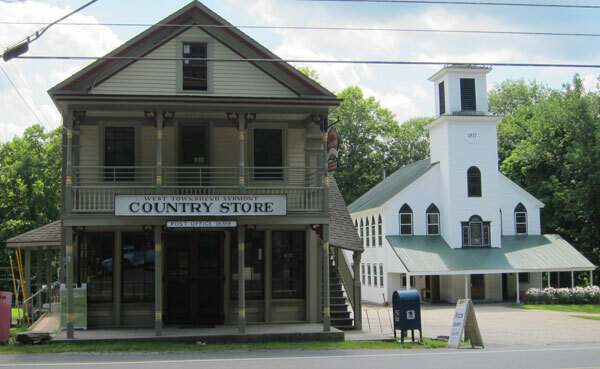 You know I love old country stores. This dates from 1848.
took an immediate left on South Mountain Road – hopefully the correct route to North Wardsboro. It was, but made last week’s excursion over the Northfield, MA hills a joke. BLUE BELLE loves dirt roads more than BLACK BEAUTY (could it be an old paint job versus a 10K one?) Back onto Route 100 we found the Stratton Arlington Road and turned right. Yes, ski lovers, besides the resort there really is a little village of Stratton which we passed through. Entering the Green Mountain National Forest the sign said “Road Closed.” Usually it is closed only in wintertime, but I soon learned a bridge was gone – most likely Irene again. At this spot on July 7, 1840 people showed their support for William Henry Harrison at the Stratton Convention. Daniel Webster was the spokesman. Log cabins were erected at the rally sight and people flocked to Stratton Mountain. 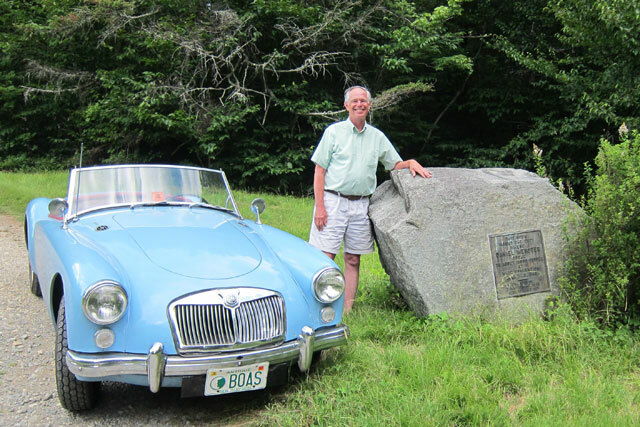 While accounts vary, historians estimate there to have been 10,000 to 15,000 people gathered at this “log cabin rally.” Considering how remote this spot is I find it hard to comprehend how people traveled to this spot in the middle of Vermont on top of the Green Mountain Range – but it makes sense as a central location. It is also a testament to Webster’s popularity as a speaker. A family was camping at this spot (if I remember correctly, David camped here once) and I asked them to take my picture. Usually alone, I have gotten over the fear to ask, and now always offer to others if I can take their group picture to include the otherwise photo taker). mention that most of the day I wondered if I was really in Vermont? Most of the cars I saw on the road had Connecticut or New Jersey license plates. 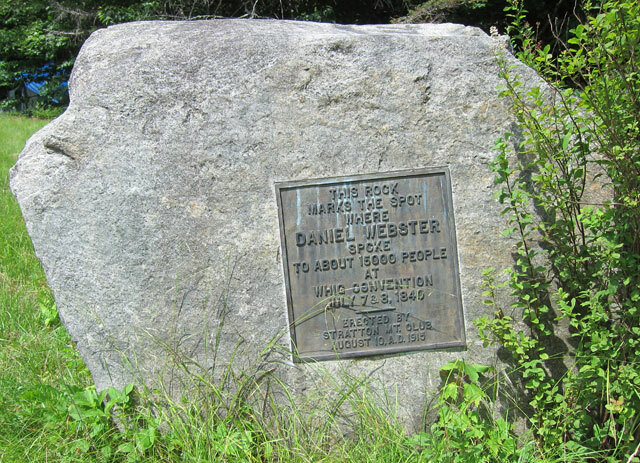 This entry was posted in Day (or maybe two) Trips and tagged Daniel Webster 1840 Vermont. Bookmark the permalink. Thank you for the lovely trip Ray. 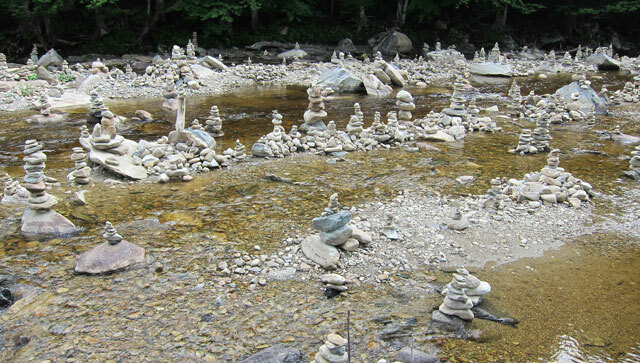 Great video of the rocks and figures they are building in the river. Funny what intrigues people to stop and build these creations. Pretty neat though. Notice the Stuffed Bun had free lunch the next day. Maybe you should have stayed over night? Probably the day they are closed. Sounds like a great roadtrip! I usually visit only once a year for 3 days, but I recognized all those roads…new to me this year was rt 121 out of Grafton to Windham Hill Inn. What a gorgeous drive! I drove it 4 times. Thank you.